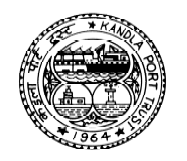 Deendayal Port Trust (DPT) has published an Advertisement for below mentioned Posts 2019. Educational qualification, age limit, selection process, application fee and how to apply are given below. Educational Qualification: Degree or equivalent in Civil Engg. from a recognized University / Institution. Selection Process: Candidates will be selected based on academic qualification.